Chart No. 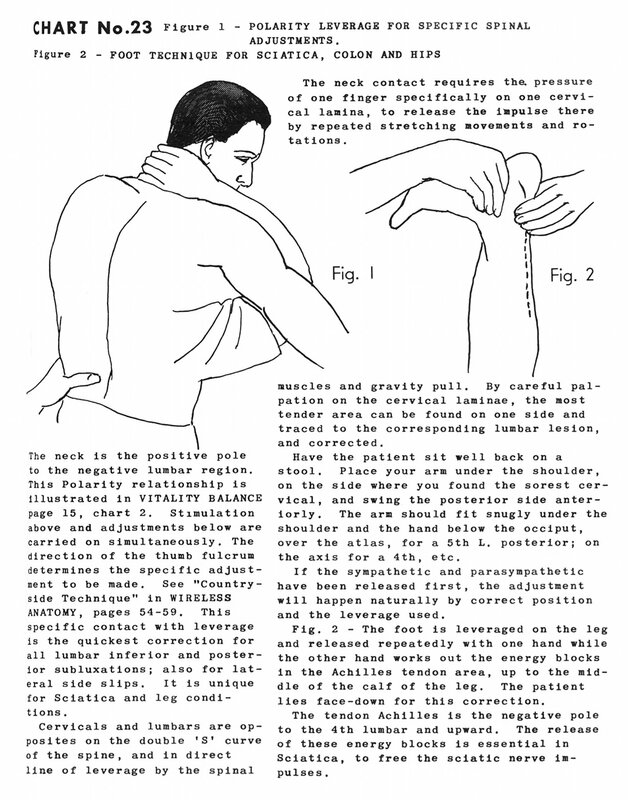 23 - Figure 1 - Polarity Leverage for Specific Spinal Adjustments. 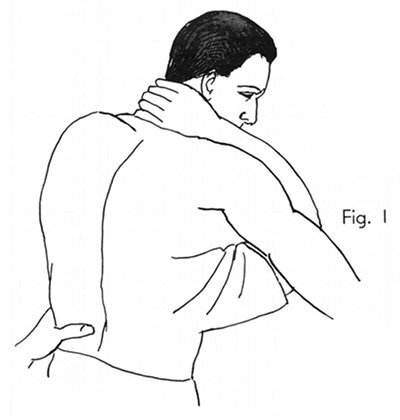 The neck contact requires the pressure of one finger specifically on one cervical lamina, to release the impulse there by repeated stretching movements and rotations. The neck is the positive pole to the negative lumbar region. This polarity relationship is illustrated in Vitality Balance page 15, Chart 2. Stimulation above and adjustments below are carried on simultaneously. 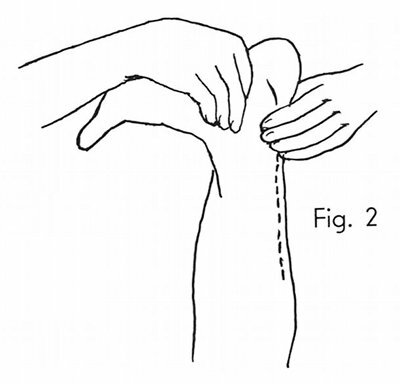 The direction of the thumb fulcrum determines the specific adjustment to be made. See "Countryside Technique" in Wireless Anatomy, pages 54-59 [Charts 45, 46, 47, 48, 49, and 50]. This specific contact with leverage is the quickest correction for all lumbar inferior and posterior subluxatlons; also for lateral side slips. It is unique for sciatica and leg conditions. Cervicals and lumbars are opposites on the double 'S' curve of the spine, and in direct line of leverage by the spinal muscles and gravity pull. By careful palpation on the cervical laminae, the most tender area can be found on one side and traced to the corresponding lumbar lesion, and corrected. Have the patient sit well back on a stool. Place your arm under the shoulder, on the side where you found the sorest cervical, and swing the posterior side anteriorly. The arm should fit snugly under the shoulder and the hand below the occiput, over the atlas, for a 5th L. [fifth lumbar, L5] posterior; on the axis for a 4th [fourth, L4], etc. If the sympathetic and parasympathetic have been released first, the adjustment will happen naturally by correct position and the leverage used. Fig. 2 - The foot is leveraged on the leg and released repeatedly with one hand while the other hand works out the energy blocks in the Achilles tendon area, up to the middle of the calf of the leg. The patient lies face-down for this correction. The tendon Achilles [Achilles tendon] is the negative pole to the 4th lumbar [fourth lumbar, L4] and upward. The release of these energy blocks is essential in sciatica, to free the sciatic nerve impulses.